Protesters in front of the Military headquarters in Khartoum. LAGOS APRIL 12TH (NEWSRANGERS)-Ousted president of Sudan Omar al-Bashir has been detained by the soldiers who toppled him, but protestors against his iron-fisted rule swiftly rejected the “coup” and vowed to keep up their demonstrations. In a sombre televised address, Defence Minister General Awad Mohamed Ahmed Bin Aouf, announced “the toppling of the regime” and said Bashir had been detained in “a secure place”, bringing an end to his three-decade rule. A transitional military council will replace the president for two years, he said, adding that the country’s borders and airspace would be shut until further notice. But in a warning to protestors, he also imposed a night-time curfew from 10:00pm (2000 GMT) to 4:00 am (0200 GMT). Bashir, who swept to power in a 1989 coup, was one of Africa’s longest-serving presidents. He is wanted by the International Criminal Court on charges of genocide and war crimes. But organisers of the protests, which first erupted in December, rejected the army’s move and vowed to keep up their campaign until the whole regime was swept aside. “The people do not want a transitional military council,” said Alaa Salah, who became an icon of the protest movement after a video of her leading demonstrators’ chants outside army headquarters went viral. “Change will not happen with Bashir’s entire regime hoodwinking Sudanese civilians through a military coup,” she tweeted. 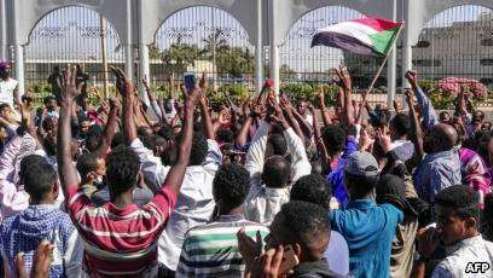 Since early Thursday morning, huge crowds of jubilant Sudanese had filled squares across the centre of Khartoum as the army promised an “important announcement”. Chanting “the regime has fallen,” they poured into the open ground outside army headquarters, where defiant protesters had braved tear gas and gunfire to keep up an unprecedented sit-in, now in its sixth day. “We are not leaving, we are not leaving. Just fall and that’s all,” they shouted. The opposition Sudanese Congress Party called on the military council to dissolve itself and form “a joint military and civilian council to run the government for a four-year transition term”. It also urged the army to give executive powers to civilians. “We will not stop our revolution. We are calling for the regime to step down, not only Bashir,” he said. Army vehicles carrying troops were seen deploying across the centre of Khartoum from early Thursday. Troops raided the offices of the Islamic Movement, the ideological wing of Bashir’s ruling National Congress Party, witnesses told AFP. Martial music was played on state television as soldiers ordered the TV to halt its normal programming ahead of Ibnouf’s announcement. Outside army headquarters, dozens of joyful protesters early Thursday climbed on top of landcruisers and armoured vehicles that had been posted to protect them from intervention by other branches of the security forces. Braving the searing 42 degree Celsius (108 degree Fahrenheit) heat, they hugged and kissed soldiers in the crowd. The military council said it was declaring a ceasefire across the country, including in war-torn Darfur. Meanwhile, Sudan’s feared intelligence service said it was freeing all the country’s political prisoners, state media reported.